Healthier food doesn’t need to mean boring. 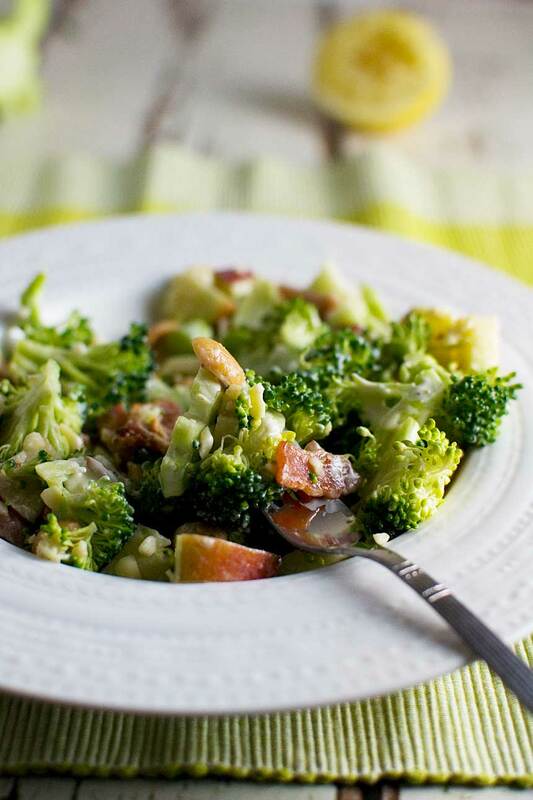 This healthy broccoli salad with bacon and apple is delicious, with a perfect balance of flavors! 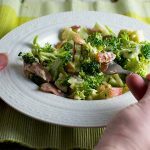 If it happens to be just after the holidays, or for whatever reason you’re wanting to get back to healthier, lighter meal choices, I figure a great place to start is with something like this tasty broccoli salad with bacon and apple. It’s not saintly (erm, bacon and cheese, anyone? ), but it’s certainly got plenty of goodness in it. What do you put in a broccoli salad? 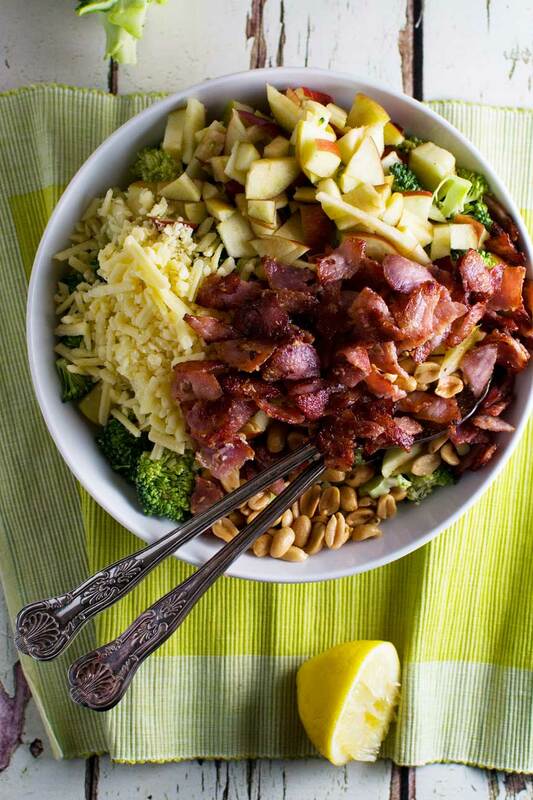 There are many different ways to make a broccoli salad, but if you’re the kind of person who likes an explosion of different flavours and textures in your mouth all at one time, then this broccoli salad with bacon and apple is the broccoli salad for you. all bound together in a creamy (but on the light side) dressing made of Greek yoghurt, a little mayonnaise, mustard and honey. How should I serve this broccoli salad? I usually serve this healthy broccoli salad by itself, with a little piece of toasted bread. It’s very satisfying indeed this way, but I think it would be great as a side with roast chicken, quiche, or fish, too. Can I make a broccoli salad ahead? This could also be a great make-ahead take-along buffet dish. If you soak the apple in lemon juice before adding it to the salad, the apple doesn’t go brown and you can quite happily keep it in the fridge for a day or so. If you do make this salad ahead, though, it’s best to add the peanuts at the last minute because they don’t hold onto their crunchiness for too long. Just look at all those delicious flavours all in one bite! What dressing do you put on a broccoli salad? Again, you could go for many different options, but I like to combine Greek yoghurt with mayonnaise to make my dressing. 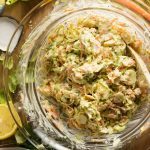 This way you keep a bit of that delicious saltiness and richness that mayonnaise adds to dressings, but you keep it on the lighter side by replacing some of the mayo with Greek yogurt. Add a bit of mustard and honey, and it’s just about perfect! 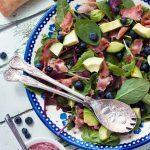 This blueberry, bacon and avocado salad is healthy and delicious! 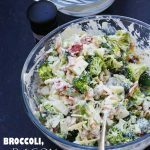 A crunchy, salty, crispy, zingy, tangy salad made with broccoli, apple, bacon, cheese and peanuts - and a healthier dressing made mostly with Greek yogurt. So delicious by itself or served with grilled fish or meat. Fry the bacon in the oil until starting to crisp, then set aside (8 - 10 minutes). Discard the ‘woody’ end part of the broccoli stalk, then chop the rest of the stalk finely. Then separate the broccoli heads into really small florets. Put the florets and chopped stalk into a large bowl. Slice the apple (no need to peel) into small pieces and put them into a small bowl. Squeeze the juice of the lemon all over the apple, then add the apple and any extra juice to the large bowl with the broccoli. Now add the onion, cheese and peanuts. Stir all of the dressing ingredients together well in a medium-sized bowl, then add to the salad. Add black pepper to taste. Mix really well. You could substitute the apple for grapes and the peanuts for pecans or walnuts if you like. This salad is also delicious with a handful of raisins added. When there is bacon in a salad, I am all in and I love the dressing. Great recipe. Thanks, Janette! This is a bit of a classic, I guess, but definitely for a reason – it’s yummy! Hooray for maternity leave! Enjoy it girl! I’m also at 37 weeks and counting down! Yikes! Oh I can’t wait to see pictures of your little bundle! And I’m so excited to know if you’re having a boy or girl! I didn’t have the willpower to let it be a surprise 😉 So yes, now that the holidays are over and I have indulged a bit too much, I’m trying to get back on the health bandwagon during these last few weeks of pregnancy. Thank so much for the awesome salad with all the goodies that I love! I’m so excited for you Helen! Didn’t know you are not finding out the gender earlier, this is even more exciting! Enjoy yourself, while on maternity leave ! Now when the holidays are over, I’d love to make some good salads like this one! Looks perfect! Pinning! Thank you so much, Mira! Really excited, although it feels like the baby will never arrive right now! I’m so excited for you Helen! I wonder if you and Kathleen will deliver on the same day!? Thank you so much, Marissa. That would indeed be very exciting if Kathleen and I delivered on the same day! It certainly isn’t impossible – our due dates are almost the same! Merci beaucoup, Eva. Nous sommes tres impatients! You said the magic word – bacon! Oh and cheese. 🙂 jk This salad looks delicious for any day of the week. 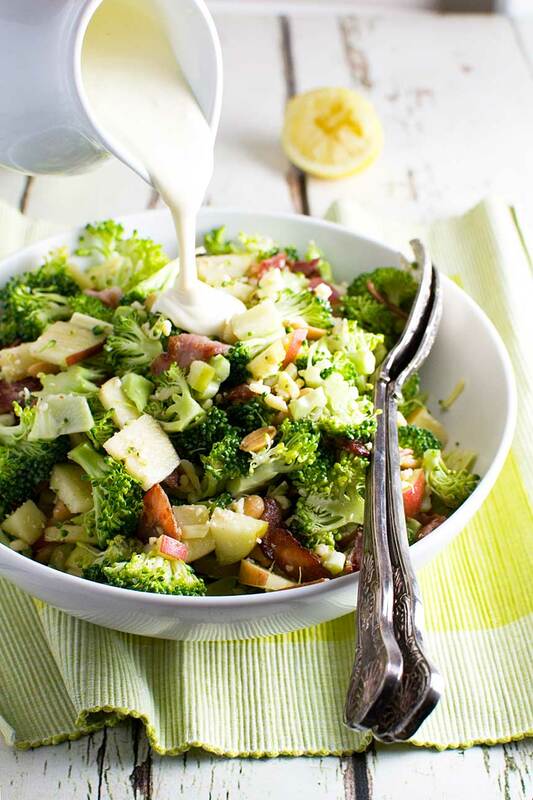 Love the raw broccoli mixed with apples and the creamy dressing sounds perfect. I bet this would also be dynamite with chicken added to it for a light summer dinner. You’re right, it would be stunning served with chicken. Got to try that – thank you! And thank you for taking the time to leave your review! This was the ultimate fall salad with the perfect crunch and salt for the bacon. 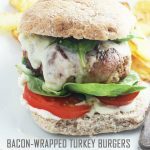 I put it on my list of things to make for holiday dinners. Thanks! You’re so welcome, Jessica! You’re right, it is a great recipe for Fall!